We booked this property specifically to be away from the hustle of the strip and to be a little closer to the natural beauty of the mountains around the valley. We had near perfect Spring weather and even had snow on the highest peaks just Beautiful!. If you want the daytime view of the red rock mountains, request a room on inside the curve of the hotel overlooking the pool. We decided to take a room on the 17Th floor, opposite side, to have the Strip & Valley view. In defence of the check in clerk, she indicated it would be bit of a walk to the elevators, ONLY one at the lobby end of the tower. Best Steak I can remember having at "T-Bones Chop House" on site. The things I really did not like, is there are no coffee makers in the room. A 5 star hotel should have this at least and a refrigerator that you don't have to pay to use. Entirely self-contained! Loved the convenience of having everything at my fingertips! Awesome the expirience was fantastic. We will be back soon! Great hotel!!! Nice location with laid back vibe. Employees were all very nice! Clean, quiet and great outdoor amenities. Nice hotel off the strip. Good dining options.Nice staff abd rooom was very clean and quiey. Issue with clogged shower drain was fixed in a timely manner. Great location. Great view of strip. Lots of things to see and places to eat nearby. Food good, choices great, facilities clean but bed needs to be replaced if you want a good night's sleep. Rest of hotel very nice. Nice hotel, went for business and did everything on site. To far away from the strip, the hotel shuttle is not really convenient, lots of waiting or extra planning. All around EXCELLENT service/amenities. Will absolutely return in the near future. Located 1.3 mi (2 km) from Red Rock Canyon National Conservation Area, Red Rock Casino, Resort and Spa is within a 15-minute drive of other popular attractions like Wet‘n’Wild Las Vegas. This 811-room, 5-star resort has 9 outdoor pools along with a full-service spa and a casino. It's centrally located in Las Vegas, connected to a shopping center,11.1 mi (17.8 km) from Orleans Arena, and also 11.8 mi (18.9 km) from Las Vegas North Premium Outlets. Sit down for a leisurely bite to eat at the onsite restaurant, or enjoy a drink at the bar/lounge. Savor a meal from the comfort of your room with 24-hour room service, or get a quick energy boost at the coffee shop/café. Buffet breakfast is offered for a fee each morning from 8 AM to 11 AM. Guests can expect to find free WiFi and 42-inch an LCD TV with cable channels and pay movies. Pillowtop beds sport premium bedding and the bathroom offers a soaking tub, a hair dryer, and designer toiletries. Other standard amenities include a minibar, free weekday newspapers, and a safe. 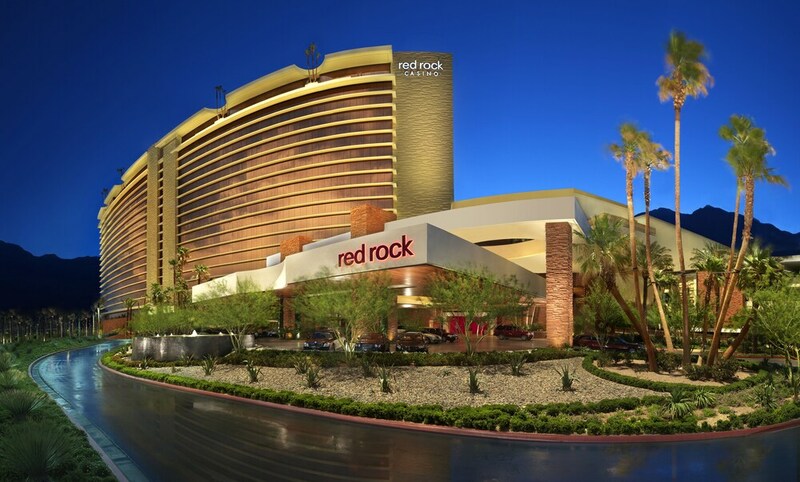 Red Rock Casino, Resort and Spa features a full-service spa, 9 outdoor pools, and a casino. Free valet and self parking are available—or if you're not driving, take the free airport shuttle at scheduled times. Multilingual staff at the front desk are standing by 24/7 to help with tours or tickets, securing valuables, and dry cleaning/laundry. Other amenities at this luxury resort include a health club, a spa tub, and a sauna. Mercaditos - Restaurant specializing in Mexican cuisine. T Bones Chophouse - Steakhouse and bar serving dinner. Feast Buffet - Buffet restaurant serving brunch, breakfast, lunch, and dinner. Grand Cafe - Bistro specializing in American cuisine. Open 24 hours. The resort has 9 outdoor swimming pools and a seasonal outdoor pool. A health club, a spa tub, and a sauna are other recreation options. The front desk is open 24 hours a day, and checking out is easy with express services. For convenient arrivals and departures, you can take advantage of the free airport shuttle (available during limited hours). Driving? This property offers free parking, along with a car charging station. Airport transportation is available at scheduled times from 6 AM to 9 PM. Fees may apply. Guests must make arrangements in advance by contacting the property. This resort provides transfers from the airport. To make arrangements, contact the property with arrival details prior to travel, using the phone number on your booking confirmation.